This Led Traffic Warning Triangle can be placed at the roadside to give on-coming traffic notice that there is a broken down vehicle ahead. The led triangles has reflectors on one side to reflect the headlights of on-coming traffic. 4 metal legs open up for support.The triangle folds flat and is stored in a plastic case or color box. 7.Suitable to use in day and night, forged, rainy and snowy days. *led triangle warning light seen in the dark. Be bright at night on the road at a construction site or work site. Alert other workers or passers-by that you need help and are under duress when shouting does not help and want help from emergency services. 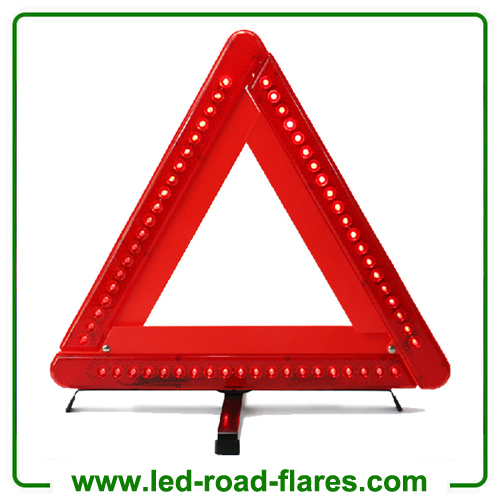 LED triangle warning light is an ideal signal light to identify Road Hazards, Mark Detours, Underwater Repair Applications And More and A great item to keep in your vehicle at all times that can be used to signal for help or identify road hazards and used for traffic control, firefighters, EMTs, rescue services, first responders, members of emergency response teams and the general public and used in cars, trucks, boats, RVs, semi-trucks, construction zones, and emergency response vehicles. long distance high visibility. LED WARNING TRIANGLE is collapsible for easy storage.